Those of you who have been following me for a while know that my human took in a beautiful snow bengal named Marley. 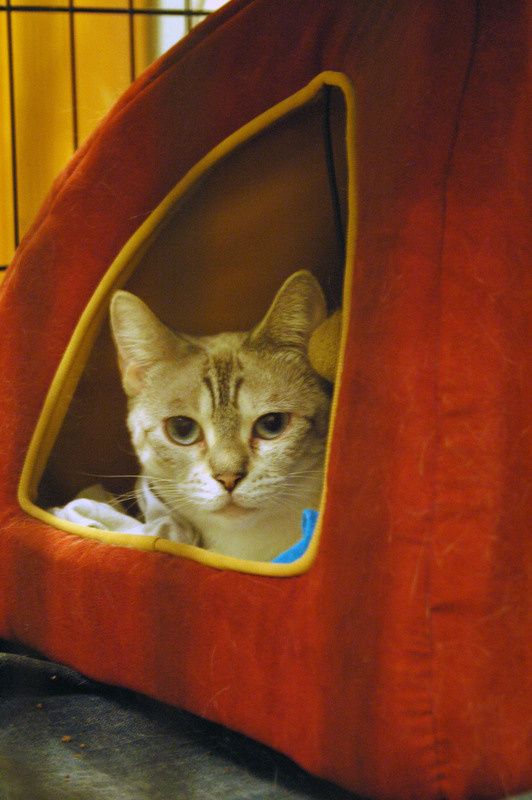 Stress is not good for a diabetic cat, but Jacey and I adapted to the situation quickly. We are both fairly mellow cats, and so we accepted Marley quickly. In fact, we accepted her a little too quickly. 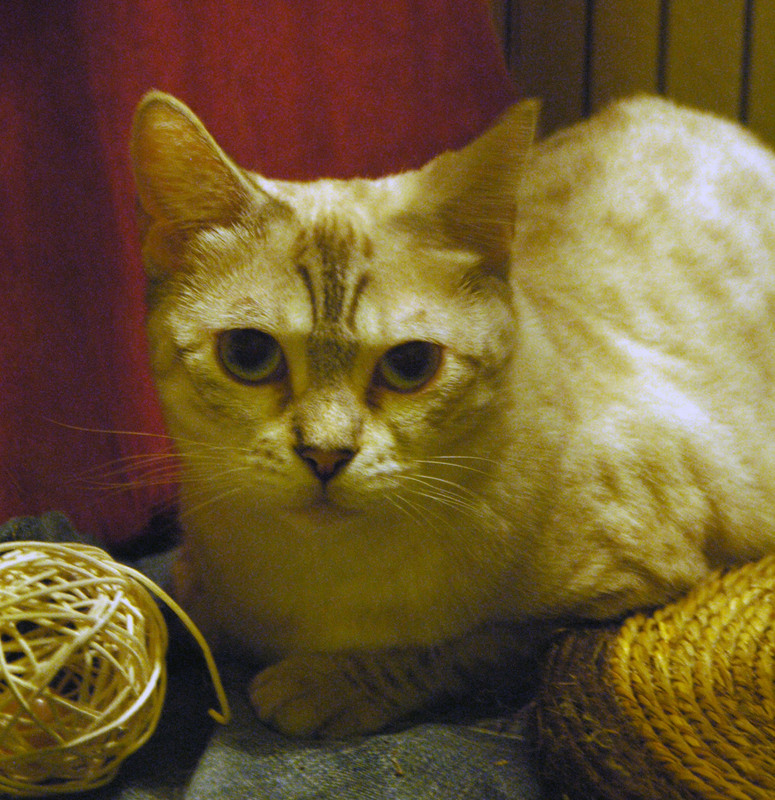 Jacey is a very sweet and playful girl, and she loves to ambush me and our human. Marley was not used to that, so she started to go hiding under the bed, and she would growl when Jacey or I approached. Our human decided that in order to get Marley used to us, he would buy a big dog crate, and put her in there. Then she could be safe behind the bars, but she would also get used to having us around. And she would stop being scared. 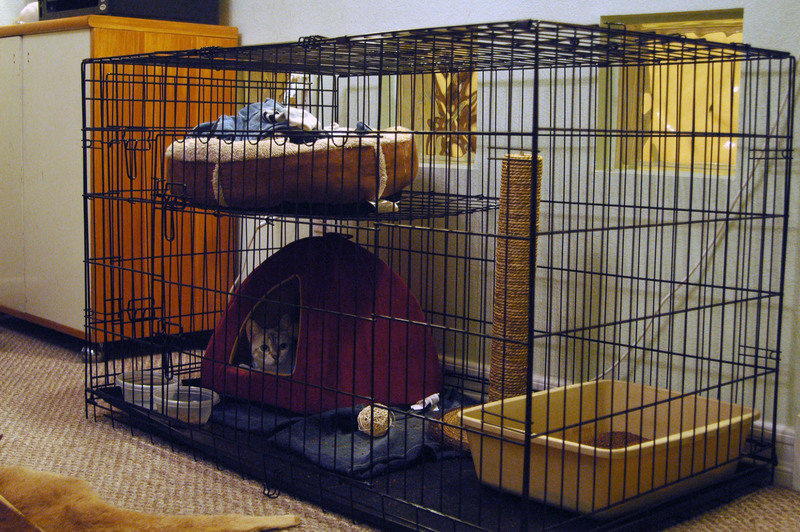 The human got the cage, and he set it up last night. He took some adv ice from the kind humans who visit my Facebook page, and set up a higher area for her to climb and he separated the litter from the bed. Marley loves soft noms, so he put those in there. She walked in, and he quietly closed the door behind her. Marley did not like it, and complained a lot about being in the cage. She was used to going under the bed, and the human, Jacey and I did not like it. She would never get used to seeing us around if she was always hiding. But we felines are adaptable creatures. I had to adapt to getting insulin shots and ear sticks because I am a diabetic cat. And Marley, des pite her shy nature, had to adapt to being out in the open. She has done very well. She has the little hidey hole to go into when she does not want to be bothered. But she also can lay down on our human’s old jeans, so she can be reassured by his smell. Diabetic cats like me are sometimes called sugar cats because our blood sugar levels are elevated. I am convinced that Marley can be just as sweet, even though she is not diabetic. I am hopeful that she will come to like me and Jacey and we will all be furiends. Does sweet little Marley look like a happy cat to you? Should the human, Jacey, and I do anything different? Let us know! Previous PostPrevious Do Felines and Flying Mix?